Thirty-three percent of 13 million American hunters hunt with a bow. In the Archery Participation Among Adult United States Residents Survey conducted by the Responsive Management, about 58% say they use a bow because it’s challenging. 24% considered the lengthened season as a valid basis, while the rest mentioned the peace, quietness, and fun it brings. Bowhunting is a great instrument for wildlife management. It promotes the growth of healthy animals and improves their habitats. It’s even economic! In point of fact, bowhunters contribute more than $13 billion per year to U.S. retail sales. It also educates you about the cultural traditions and the hunting heritage of the area you’re hunting at. Aside from being used as a recreational tool that brings people together, bowhunting is also therapeutic. It serves as an effective escape pod that allows you to take flight from the present stress and demands of the world. Bowhunting offers a lot of benefits. That’s why it is ideal to choose the best hunting bow for you now. This comprehensive guide will assist you by giving you hunting bow reviews; but we are not talking about any bow here. We’re talking about the top hunting bows on the market today. Do yourself a huge favor and continue reading. Before you can decide which hunting bow to get, it’s only rational to read and research first. There are a number to choose from but of course, the best one for you is the one you can handle and afford. With an unlimited budget, though, money won’t be a problem. But if you have a lot of things to pay and worry about and your budget is fixed, then don’t worry, you can still have the best one for the price range you have in mind. Researching is undeniably time-consuming and can even be confusing. That is why we have done the extensive research for you and we now provide you with the best hunting bow for the money for every possible budget you have. This takedown recurve bow is the best budget hunting bow you can get. Because it comes in eight different draw weights that are ideal for various shooting capability, it’s also the best hunting bow for beginners. The Sage Takedown is certainly well-built because it is made from Hard Maple, Olive Dymonwood, and Oak. As the fastest recurve bow on the market (shooting light arrows at 184 fps), this is definitely one extraordinary partner for hunters. You won’t have to fret about transporting this one as well because it’s easy to assemble and take apart. You can choose the draw weight according to your physical capacity. Draw weights are available from 25-60 lbs. If you need to increase or decrease draw weight, you may do so without buying an entirely new bow because the limbs can be purchased separately. The gorgeous and well-crafted design is impressive. The Dacron Endless loop bow string that comes with it is reliable. It comes with a B-50 bow string, an arrow rest, and pre-installed brass brushings perfect for the Samick Sage Hunting Kit. The bow is not completely quiet. It is great for hunting but just to be safe, get a noise dampener for this one. The screws are misaligned in some deliveries and they may be of low quality. Bottom Line: Considering the price of this durable bow, it’s already one big catch. Add up the pros and you’ll surely get satisfaction for its cheap price. With a smooth draw and a powerful shot, this is definitely the best hunting bow for the money. The Saber Takedown features Martin Archery’s durable, lightweight, metal riser. With a more advanced Saber handle with two integrated Vibration Vortex VEMs mounted in the riser and the Thermal V protective dampening grip, you’ll get a vibration-free shot. Because it’s a takedown bow, you can remove the limbs from the riser with ease anytime for easier transport. There are six available draw weights: 30, 35, 40, 45, 50, and 55 lbs. The grip is comfortable to hold. Drawing this bow is smooth and it sends arrows with impressive power. It’s ideal to use even in tough weather conditions. It’s very accurate for its affordable price. The limbs are of premium quality. The vibration-reducing technology is advanced and reliable. It’s 64 inches long which make it more accurate than other bows in its price range. The arrow rest of this bow is made of rubber and you may want to replace it with a metal rest. But some hunters prefer to adjust to it instead of replacing it. It’s for right-handed hunters only. 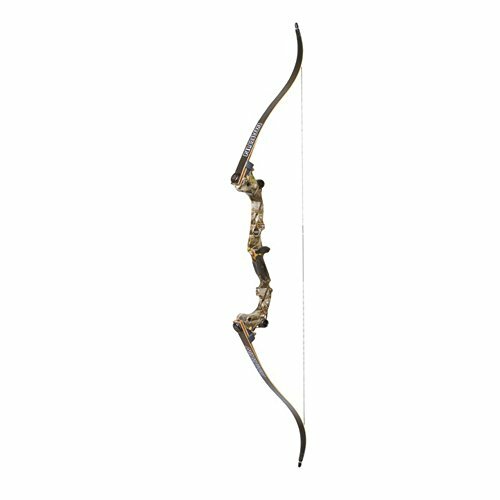 Bottom Line: If you want to save money and a lot of time, consider this takedown bow that offers more for its extremely cheap price. It’s great for a beginner, an intermediate, and even for an advanced hunter. Bear Archery’s Grizzly Recurve bow is well-known for its simple yet stunning design that hasn’t changed in 50 years. This hunting bow is finished in satin glow, that aside from contributing to the entire design also serves as a shield that lessens dampness and abrasion. This one-piece riser is made from durable hard-rock maple with limbs overlaid with clear maple. Smoother draw and better arrow grip are possible thanks to its arrow shelf with Bear Hair Rest and leather slide plate. Seriously, you’ll never go wrong with this tough 58-inch hunting bow. Aside from hunting, it’s also great for target practice. It’s excellent for intermediate and advanced hunters because of its available draw weights in 50, 55, and 60 lbs. It’s impressively quiet, which is important in hunting. It’s accurate in all weather conditions. It comes with a Dacron Flemish twist string which is dependable. It has undergone FutureWood, Bear’s manufacturing process that gives new physical properties to the wood in the handle section without removing the natural properties of the original wood. The accessories are limited but really, you won’t need additional accessories. It’s ready to shoot out of the box. Because it isn’t a takedown, you may need to be extra careful when you transport it. Bottom Line: If you can afford this then please don’t settle for less. Used by Fred Bear himself on his quests for African lion, cape buffalo, Alaskan polar bear, and the British Columbian grizzly bear, this bow has proven its eminence as the best hunting bow on the market. Its features include a large profile leather rest plate and a forgiving feather arrow rest which does not wear off, Satin Finish, and 60″ and 64″ AMO length. It has undergone the FutureWood process as well. It’s easy to tune and maintain. It’s great for a beginner, an intermediate, and an advanced hunter because its draw weights are available in 45, 50, and 60 lbs. This bow has been in production for 49 years. It’s comfortable to hold and draw. The classic design is so breathtaking; you’d know why simplicity is beauty. With the Dynaflight 97 Flemish string, you’ll get 3-4% faster arrow speeds than other strings. It doesn’t include a stringer so you should get one. It doesn’t allow you to add a bow sight or any other accessories because its aim is to be purely simple and traditional. The bow weighs 3 pounds. This is a con only if you’re used to 2.2-2.9 pounds of weight. But give it a few weeks and you can adjust. Bottom Line: Let me tell you right now: when money is no object, all the rules of the game completely change. And it is only wise to opt for the hunting bow that will positively change the way you rule over your target game. The Martin Archery Hunter is another spectacular bow in the high price range. It’s one of the most successful recurve bows ever made. 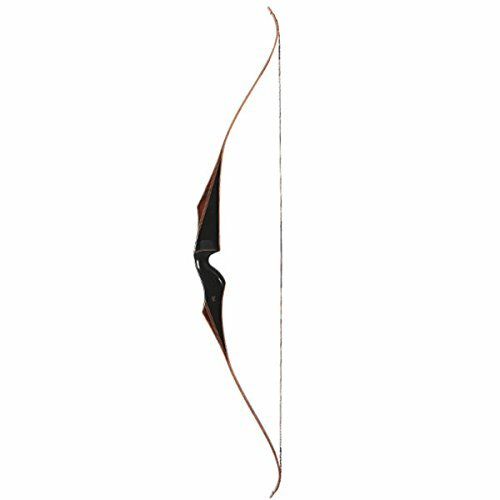 Living up to its name, this 62-inch bow is definitely perfect for hunting because of the stability and accuracy it offers. It even provides an impressive cast and speed. This bow features a traditional rest, limbs made of Eastern Hard Maple laminations and black fiberglass, and limb tips of Bubinga and black fiberglass overlays. Its riser woods are Shedua which are beautifully outlined with hard maple. It also includes a Flemish bowstring and stringer. It’s easy to assemble. It would probably take you about 15 minutes or less to assemble this one. This is great for hunters; whether you’re a beginner or a professional hunting small or large game. It’s ideal for archers who aims for accurate shots and consistent groupings. Regardless of weather conditions, this bow will work flawlessly. It’s light, weighing only 2.1 pounds considering its length of 62 inches. 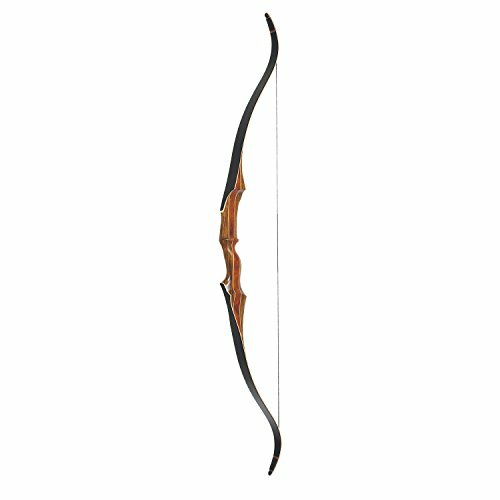 This bow is recommended for anyone because its draw weights are available in 40, 45, 50, and 55 lbs. It’s not a takedown bow so you might have a little difficulty transporting it. It’s pricey. This is a con only if you can’t meet the expense of this bow. Bottom Line: If you’re looking for quality performance and you can spare its price, then there’s no need to think twice, go ahead and purchase this exquisite hunting associate. 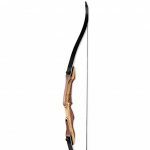 This pre-assembled right-handed youth recurve bow by Crosman Archery is definitely the best kids hunting bow. It has a center shot composite riser and all-weather heavy duty strings. This is one durable bow thanks to the heavy weight fiberglass composite limbs. It’s great for kids because the hand rest offers more comfort to the shooter and its 20-pound draw weight is perfect for beginning archers. This 45-inch hunting bow has a brace height of eight inches and weighs 2.8 pounds. It can draw up to a maximum of 25 inches which will help your child improve his shooting even after a number of years. 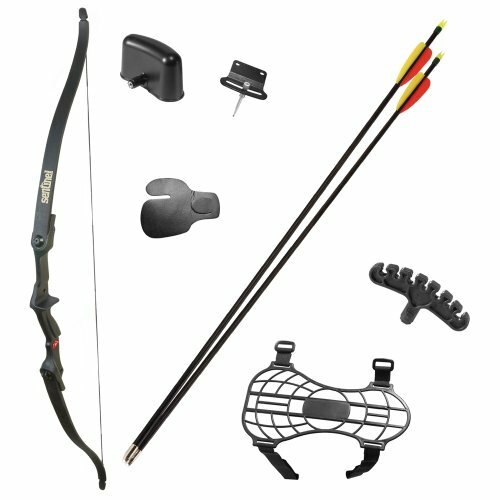 The package includes two composite youth arrows, two-piece quiver, finger tab, an arm guard for protection, arrow rest, and pin sight. It’s lightweight which makes it easy to carry. This bow can be used in all types of weather because of its durability. It’s safe and easy to use but still, parental supervision is required for children. It comes at an extremely affordable price. The accessories are of low quality. It’s recommended only for children, novice, and right-handed hunters. Bottom Line: If your child aims to be either Green Arrow or Katniss Everdeen, this is a great bow to start with. It will improve their adaptability and accuracy. Don’t worry about the specifications because you can always buy a better one when the right time comes. What Makes a Recurve Bow So Great for Hunting? Also called “traditional bows”, these bows have a pistol-style grip that adapts well for use with a bow sight or other accessories. 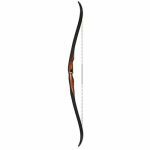 Recurve bows are widely known for producing smooth, quiet, and fast shots. If you don’t want to startle your prey, a recurve bow is ideal for you. The specifications of a recurve bow such as its limbs and noise dampeners will allow you to catch your prey and make your preparation and waiting time worth the result. Hard work and patience will only pay off if you catch your prey, and you’ll need a quiet bow for that. 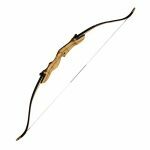 In choosing a recurve bow for hunting game, you should also bear in mind that the best draw weight is the one you can handle. Don’t waste your money on a bow with a lower draw weight than the ones you had. It won’t challenge you and won’t allow you to grow. But it’s essential to know that if you choose a bow with extremely higher draw weight than what your body is used to, it won’t be of great benefit too. Changing from 40 lbs. of draw weight to 60 lbs. is utterly unreasonable. You would want to take care of your body by not straining and expecting your muscles to adjust to a 60 lb. draw weight in a blink of an eye. You have to change gradually. As recommended, a beginner hunter should start with a 40 lb. draw weight. Getting a hunting bow that’s lower than 40 lbs. is simply useless. You will need the strength of the 40 lbs. draw weight (or more) to pierce through the body of your prey unless you’re just trying to waste an arrow and scare your game away. But then that’s not the work of a true hunter. If you’ve been used to 40 lbs. and you think you are ready and confident about your muscles, then go for a hunting bow with 45 lbs. of draw weight or more. But like I mentioned, make sure you change gradually so as not to stress your muscles and affect the accuracy of your aim. Muscle fatigue from holding and drawing is one of the most common bow-shooting errors a beginner bowhunter makes and we want to avoid that. A recurve bow is a little difficult to transport especially if it’s not a takedown. If you don’t remember, a takedown bow allows you to remove the limbs from the riser by unscrewing a few screws for ease of transport. You have to consider this unless safely transporting a 60-inch hunting bow is not a problem for you. Hunting is most likely one of the reasons why some people get into archery. It has become an activity that gathers shooters or hunters together to discuss the best bows and tools recommending for hunting small, medium, and large game. Hunting bows are usually colored dark or finished in camouflage. Other hunters prefer bows with shorter brace heights to maximize the speed of their bows while some opt for longer brace heights so that the string will less likely hit bulky clothing used in cold weather and to make the bow less complicated to draw. Some hunters prefer light bows because they are easier to carry through the hills and easier to manipulate behind trees. Most hunting bows these days range from 28” to 36” ATA and 5” to 8” brace height. Bowhunters generally prefer higher draw weights because they offer more kinetic energy to arrows to penetrate the body of their target. Buying a hunting bow is not easy. But always remember that comfort is greater than the specifications. The specifications of the bow may be great, but if most reviews say it’s difficult to use, the grip is uncomfortable, and that it’s extremely heavy, then don’t mind the specifications. 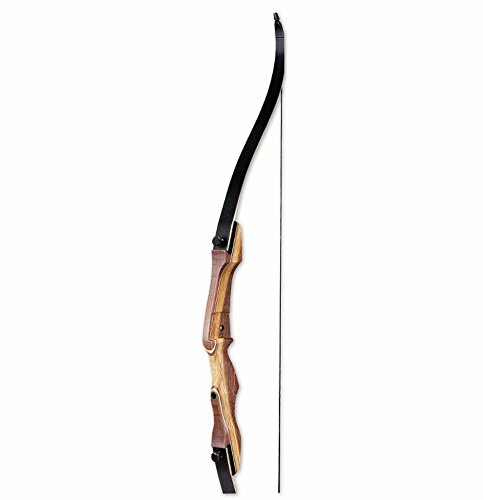 Buy a hunting bow you can actually use. Consider your budget as well. Always check the latest price before you purchase. Choose wisely and don’t settle for less if you can afford more. Below are the things to consider when selecting the best hunting bow for your needs. The straight bow is a more traditional bow that looks straight when viewed from the side profile. It’s a little difficult to use because it has the arrow has a tendency to leave the bow before force is maximized. This bow provides maximum mechanical advantage and reduced draw weight at the beginning of every draw. As the archer pulls the string, the draw weight increases; thus, allowing the arrow to leave the bow with maximum force that quickly decreases. It’s generally recommended for experiences archers only. The compound bow uses pulleys and cables to bend the limbs that are harder than those of a recurve bow. The recurve bow has a particular shape that allows the tips to curve away from the archer as the bow is strung. A recurve bow is more effective in storing and delivering energy. It offers the arrow a better trajectory thanks to the increased energy and speed transmitted by the bow. It is the perfect partner of beginners, intermediate, and advanced hunters. It’s important to choose a hunting bow you can easily carry and transport from place to place. Hunting bows usually range from 2-3 pounds and beginners usually prefer the lighter ones. The best recurve bows used for hunting usually weigh 3 pounds. Don’t forget to acknowledge your need for comfort. Comfort depends on the hunter and it usually is a personal preference. The speed of your bow is important in hunting. A faster bow offers a higher chance of penetrating the skin of your game; thus, promoting a clean kill. Don’t torture your target by shooting arrows over and over just because your arrows lack the speed to pierce through their skin deeply. You need to pick a bow that balances well and has a suitable brace height. 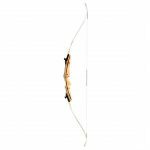 Bows with longer brace heights can be more forgiving in adverse conditions because the arrow is on the string for a shorter period of time. They are less likely to be twisted by the archer’s grip as well. If you’re a beginner, it’s always safe to go with a bow that has a brace height of 7-9”. The draw weight is the amount of force you have to exert to pull the string. For ages 14-17, pick a bow with a draw weight of 16-22 lbs. For men and women with above average strength, the recommended draw weight is 40-60 lbs. Some recurve bows may not include the best accessories or may even discourage the use of additional accessories, but they can help. The bow sight will help you aim for your target accurately especially if you’re still a beginner. Quivers are practical for your arrows too. Bowhunting often has different seasons and restrictions from firearm hunting. The laws differ significantly among areas. Legal and cultural approaches specific to the area must always be taken into consideration by the hunter. A true and responsible hunter should be aware of the limitations set by the area where he hunts. There are a lot of factors to consider when you hunt and when you buy your equipment. But bear in mind that no matter how awesome your recurve bow is, if you don’t know how to use it properly, it will be useless. Consider the specifications but remember to read the manual to avoid misusing it. Select the appropriate arrows, care for your bow, and refrain from customizing it too much because it may void the warranty. You also need to remember that if you’re a beginner, you have to practice using your bow to avoid missing your target and wasting arrows during the actual hunt. Hunting bows have been pushed throughout the recent years and products are at a very high quality today. This makes choosing difficult especially with the vast number of price ranges and products available on the market. However, after reading this comprehensive guide of the best hunting bows, I hope that I have made it easier for you to decide. Now check out these awesome bow hunting kill shots!